As always, thanks for the detailed review. Well done, as usual. I’m sure LionSteel will sell a bunch of TM1s. I’m glad to see LionSteel trying IKBS. But why pair these terrific, fast bearings with a thumb disc and back lock — even a good one? You say LionSteel is trying to be creative, and I guess they are. As for me, I’d much prefer a frame or liner lock — and a flipper! Thanks for stopping by, Michael. I hear ya, and I am sure we will see more fun stuff from LionSteel with IKBS, flippers, etc. The CRKT HiJinx is a great example of that. There are no lack of IKBS flippers in my collection, but this is definitely the first IKBS lockback I have ever handled, let alone owned. Man, now THAT is a beautiful knife. I haven’t seen the reverse tanto blade profile much, but I could immediately see how useful it could be. I just wish I had 400 sheckles of disposable income to drop on one. As always, a great in-depth review Dan. “Traction plans” are signs of one thing – poor ergonomics. Consider a Mora Classic or a Lum Chinese – old school well designed ergonomics negate the need for silly jimping or oversized guards. Granted, these knives are not made for stabbing but that is not something I’ve done a lot of on- or off duty. Here, Lionsteel seem to have integrated that most rare of ergonomic tweaks (at least in folders): a palm swell. By simply adding the contact surface between knife and hand the most marvelous control can be exercised over the blade, an added benefit is the great hand-feel it must have. Well done Lionsteel. 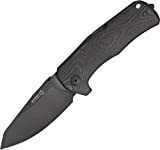 In regards to the addition of IKBS to a back lock, which might seem a bit odd at first, bearing systems lend strength and eliminate side/side play in any knife. I would bet this knife is solid in lock-up, much more so than most modern backlocks. All in all – Lionsteel continues to raise the bar for what should be the gold standard for production folders. With this offering they also show that they are more than a one-trick (Ti framelock) pony. Nicely written review Dan, I’m very glad to see more of your videos. Thanks for stopping by, Lew. I can’t help but agree with your take on traction plans. Sure jimping has its place, but I agree wholeheartedly that this knife does not need it. I didn’t think about the bearing system adding strength – good point. You are right, not so much as a suggestion of blade play in any direction. Frankly, I don’t see a need for a bearing system in any folder, so I can’t get behind the argument that a back lock knife doesn’t need a bearing system. I agree, it is great to see LionSteel show some versatility. I hope to see some of this trickle down into their more budget minded offerings as well. I have never seen a reverse tanto before. I’m not sure why not because that blade shape looks incredible useful. Way more that a regular tanto, which I have never liked. I agree, Ameer. This blade shape is much more useful for my purposes than the regular tanto. If you haven’t checked out the BM 940, it’s worth a look. So here’s my question. How do you maintain a knife like this? As far as pulling it apart to clean out the bearing races/grease the bearings, clean out crud of the back-lock contact surfaces, etc with a one piece handle? Furthermore, how the heck did they actually assemble this… it’s like those glass bottles with a penny inside… baffling! Great question, James. In the past I have always cleaned out my bearing knives with hot water and then loaded them up with Aegis Solution EDCi (a rust inhibitor) or lubricant (tuff glide in my case). I’ll be curious to see if anyone else chimes in on what they do. I will say that there should be some amount of “flex” in the carbon fiber handle, you may be able to carefully completely disassemble the knife, but personally I won’t be attempting it.